This was my first try to write some code for the vectrex. 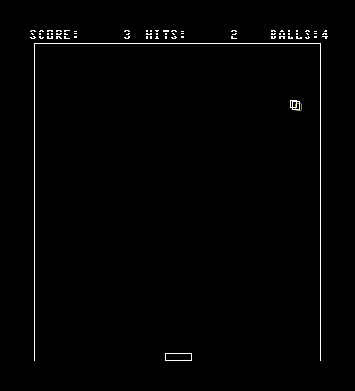 It is a very simple rendition of the old Pong game, done in only a few hours. It shows in simple terms how to get a vectrex game running. ; see bottom of file for further addresses! CMPA #$00                ; is a button pressed? CMPB #PADDLE_X_RIGHT     ; is it at maximum right position? CMPB #PADDLE_X_LEFT      ; is it at maximum left position? ; optimization could easily be done e.g. via direct addressing! LDA ball_speed_x         ; in what direction is the ball moving? CMPB #BALL_X_RIGHT       ; ball right out of bounds? CMPB #BALL_X_LEFT        ; ball left out of bounds? LDA ball_speed_y         ; checking for bottom? BPL check_for_upper_border ; or upper border? LDA paddle_check         ; is ball allready lost? CMPA #FALSE              ; allready lost? BGT paddle_not_there     ; oops, ball seems lost! 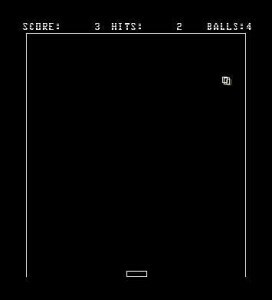 CMPB #SCREEN_BOTTOM      ; will ball move off the screen? LDB ball_x               ; load x position of ball again! ; let's see if we can make it a bit more difficult! TSTA                     ; positive or negative random? TSTA                     ; is it positive? ; note: PING1 and PING2 stolen from patriots, hope you don't mind John!